Cebu City, the Queen City of the South, shares memories that will surely interest people. It started from a sleepy fishing village in 1521. Magellan arrived and planted the wooden cross, which became Cebu’s first symbol of Christianity. The said cross is now located at the upper Magallanes, a street named after Fernando de Magallanes. He was intrepid Portuguese explorer who made the great voyage of exploration under the flag of Spain. In April 3, 1898, General Leon Kilat of Bacong, Negros Oriental, organized a revolution against the Spanish colonialism. The Spaniards then decided to build a shelter for themselves. It was Miguel Lopez de Legazpi who insists on building a fort, which is now famous for being the oldest and smallest fort in the country, the Fort San Pedro. However, on December 1898, the Americans beat the Spanish fleet during the war of Manila Bay. And the fort fell into the native Cebuanos’ hands. With the American reign in full force in 1901, the Senate Pro Tempore, late President Sergio Osmena Sr. and the Congressman and majority floor leader in the House of Representatives, late Senate Manuel Briones took action for Philippine Independence. One of the most unforgettable moment in Cebuano history is the granting of charter by virtue of Commonwealth Act No. 58 on February 24, 1937. The late Senator Vicente Rama helped as the author and sponsor of the bill. Elpidio Quirino, as the representative of Manuel Quezon, appointed the mayor and board members of Cebu City. Due to Cebu City’s extensive population and strategic location, it became the principal Japanese base after their landing on April 10,1942. Finally, on March 1945, Cebu felt freedom when American liberation landed in Talisay town. In full circle, Liberation restored law and order and established the Philippine Civil Affairs Unit (PCAU) in the city. In April 1965, Cebuanos focused on Christianity, Don Legaspi and Fray Urdaneta ordered to build the San Augustine Church, which is now called the Basilica Minore del Santo Nino, in honor of the first miraculous image of Señior Santo Nino. Cebu, which was formerly called as Sugbu, Zebu, Zubu, Sebu, Sibuy and others by merchants, from a sleeping fishing village, is now one of the most productive cities in the Philippines. And now that’s something we are certainly proud of! The most famous of all historical landmarks in Cebu City. This cross was planted in Cebu shores by Ferdinand Magellan in April 14, 1521, marking the spot where the first Catholic Christians- Rajah Humabon, Queen Juana and about 400 followers were baptized by Fr. Pedro de Valderama. Encased in hollow tindalo wood, it is now for centuries housed in a kiosk made of adobe wood and red-brick tiles. Devout Cebuano's and visitors never fail to pause and pray, drop coins and light votive candles before the Magellan's Cross. It has been venerated by people from all walks of life in the past four centuries. Located at Beverly Hills, Cebu City. This temple preserves the teachings of Lao-tse the 600 B.C. Chinese Philosopher. Everyday people climb its 99 steps to light joss sticks and have their fortunes read. The BASILICA MINORE DEL SANTO NIÑO, the only basilica in the Far East, is yet another historic landmark that will never cease to amaze its visitors. It in itself is a museum, a repository of beautiful religious images, and oil paintings of Augustinian saints, martyrs, and bishops that hang in the corridors of the convent. 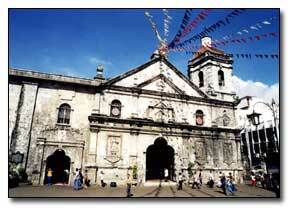 This Basilica was the former SAN AUGUSTIN CHURCH, built upon the order of by Don Legaspi and Fray Pedro de Urdaneta. The Basilica houses the country's oldest religious image-the Miraculous Image of the Holy Child Jesus more popularly known as "SENOR SANTO NIÑO". 8 ft. thick and each of the towers stands 30 ft. from the ground. Cebu’s Plaza Independencia was formerly called "Plaza Libertad". Strategically located between Fort San Pedro and the building that used to house the old Gobierno Provincial, it now becomes the most favored spot for picnics and trysts. Dominated by the obelisk of Legaspi, Plaza Independencia is Cebu's most historically significant plaza.